How can someone possibly do something good everyday? It sounds exhausting, doesn't it? But there are so many ways to do small, good, things. If I can fall asleep, at what is most likely way to late of an hour, knowing that I made an effort to make the world better in a very small way, then I rest sweeter. Do I save the world every day? or choosing to be thankful as I fold and sort a mountain of laundry, because that mountain of laundry represents the little ones entrusted to my care. that my jumpy, fidgety daughter has yet again, spilled all over the table. Because, let me tell you. All that is in me wants to freak out. Some days I just pray that we can survive breakfast without a spill. I consider those mornings a gift. But in my annoyance when I am spending my nearly daily ritual of cleaning up some sort of spill, I rarely see past the fact that in my frustration, I am taking something for granted. Water that does my laundry. Water that bathes my children. Water that I mop the floor with. Water that fills our cups. So some days, my goodness is small. Globally insignificant. But other days I want my goodness to change the world. If only for one person. One family. One community. Last year God planted a dream in my heart. A dream that my sweet friends believed in. A dream that you believed in. We altered the future for two communities. we can accomplish infinitely more than we would ever dare to ask or hope. Please visit Project 320 to learn more. Woohoo!! Bring on the faith!! Four wells this year? You are one amazing woman, Julie! Changing the world and making it better - thanks for the inspiration! Love you & your heart. So thankful to be a part of this. To God be the Glory! 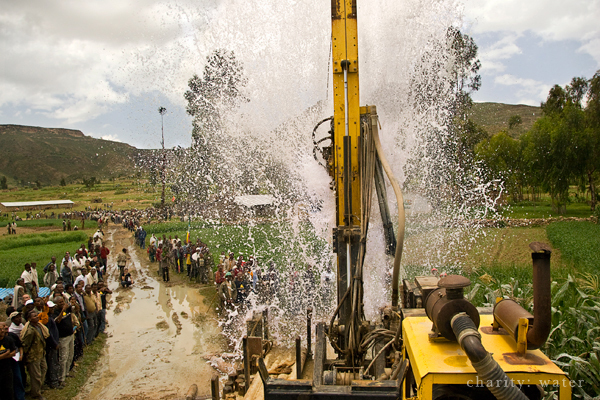 Let's build more wells! You all are amazing and God is using you in wonderful ways!!! I understand the spilling thing. My 12 year old daughter uses a sippy cup (of her own choice) because she's getting tired of cleaning up her own spills. We have a good laugh about it. Wow! You are one amazing girl. I became aware of this project last year & donated. It felt great! Thanks for the reminder that we can't quit helping! can't wait to see what God does this year...I just know it's gonna be good!! Yes, love your heart. Will be praying about how I can (and will) help... Gotta go. My child just spilled an entire box of cereal on the living room floor. No joke. Is this the same pne that MHCS put on last year? Let me know! I WANT IN! Jars of Clay founded this project and spoke about it at a concert. They challenged people to abstain from all beverages but water for 40 days and then keep a tally of the money saved. Our sacrifice = someone else's blessing of clean water. I thought that was a great, specific way to "raise" money to give, whether to them or Project 320. Really cool. I cannot wait. I am off to visit it. You really are amazing. So amazing. K...I want in on the ground up this year. Other than donate... What can I do to help? Just watched 'running the sahara' and it messed me up! Those crazy dudes ran the equivalent of 150 marathons in 111 days to promote awareness of water conditions in Africa, and raise $ to help. Now, I can't do anything like THAT, but it's the little things that make the biggest difference. Right?